Welcome to the Denver Alumnae Chapter of Kappa Delta Sorority! The Denver AC is made up of KD sisters from chapters across the country! 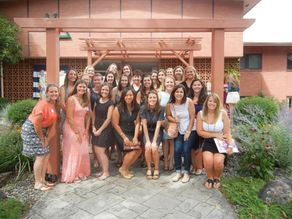 We are dedicated to our sisterhood through philanthropic and social events. If you are new to the Denver area or have lived here for a while, we look forward to meeting you! Find us on FaceBook and our book club on Goodreads! For more information on any of our upcoming events please contact Larissa. **If you are a collegian and need a recommendation for recruitment, please email our Recommendations Chair, Julie Burck for more information. If you have anything you'd like to add to the website, please email Kat.